We know that ASUS is working on a new ZenFone 4 series that is expected to be released in the coming weeks, however, not so much is out there regarding the specs of the phone. 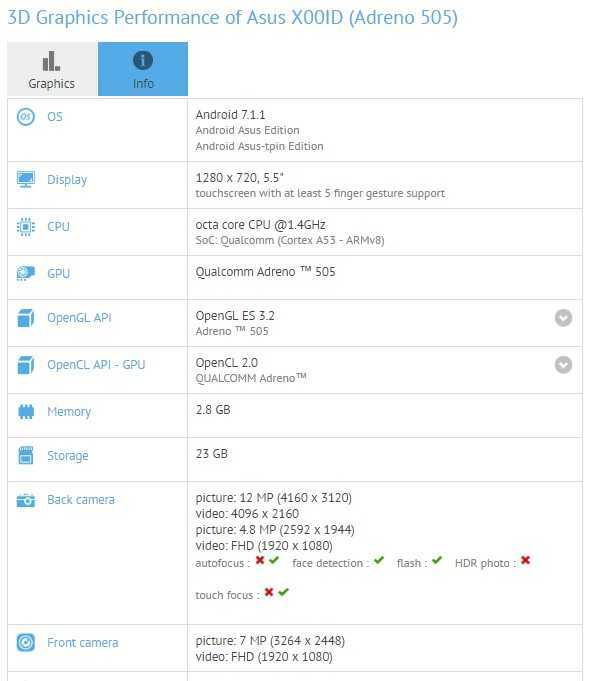 Like last year, we expect the ZenFone 4 series to come in several variants, with one of them being the ZenFone 4 Max. Apparently, this ZenFone 4 Max variant has just appeared on several bodies, including the Wi-Fi Alliance and Bluetooth SIG. If anything, this is an indicator that the handset, alongside other ZenFone 4 series variants, will be released very soon. While the phone had appeared on the likes of GFXBench and Wi-Fi Alliance with model number X00ID, the latest listing on Bluetooth SIG has just confirmed that it’s indeed the ZenFone 4 Max. Discovered by notable tipster Roland Quandt, the ZenFone 4 Max has also appeared on Wi-Fi Alliance, confirming that the phone will indeed come with Android 7.1.1 Nougat out of the box. But as usual with WFA listings, there’s little in terms of other specs. The good side of the story is that this ASUS ZenFone 4 Max handset has also appeared on GFXBench, giving us details of what to expect in terms of hardware specs. The phone will feature a 5.5-inch display screen that has an HD resolution and under the hood, there’s a Snapdragon 430/435 SoC paired with an Adreno 505 GPU and 3GB RAM. The ZenFone 3 Max (ZC553KL) had the same screen size and processor, but a better 1080p resolution and more RAM of 4GB (although other variants had 2GB and 3GB RAM modules). In terms of storage, the listed ASUS ZenFone 4 Max has 32GB of internal storage, same as last year’s variant and for the cameras, you get a 13MP shooter on the back and an 8MP lens on the front for selfies. From the look of things, this variant could be the successor to the low-end ZenFone 3 Max with model number ZC520TL, which had a smaller 5.2-inch HD display, a MediaTek MT6737M SoC paired with 2GB/3GB RAM and 16GB/32GB of storage. The main camera remains unchanged, but the front had a 5MP shooter. Well how did you figure out it’s a sd 430 and not 435? Thanks for the heads-up. Updated.